NEW YORK – A quick jaunt over the Brooklyn Bridge from Manhattan to Brooklyn’s Dumbo district brings you to one of NYC’s newest and most unique attractions in recent years (as my friend who joined me said, “only NYC would have something like this”). 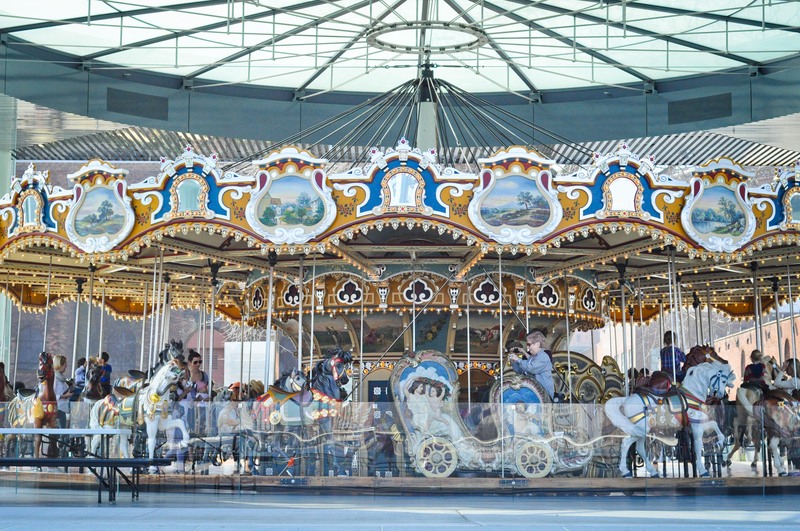 There lies Jane’s Carousel, a fully restored 1922 classic carousel encased in a acrylic cube designed by French architect Jean Nouvel, the man behind Tokyo’s sublime Dentsu headquarters in Shiodome (my fave skyscraper ever) and MOMA’s recently announced tower addition. 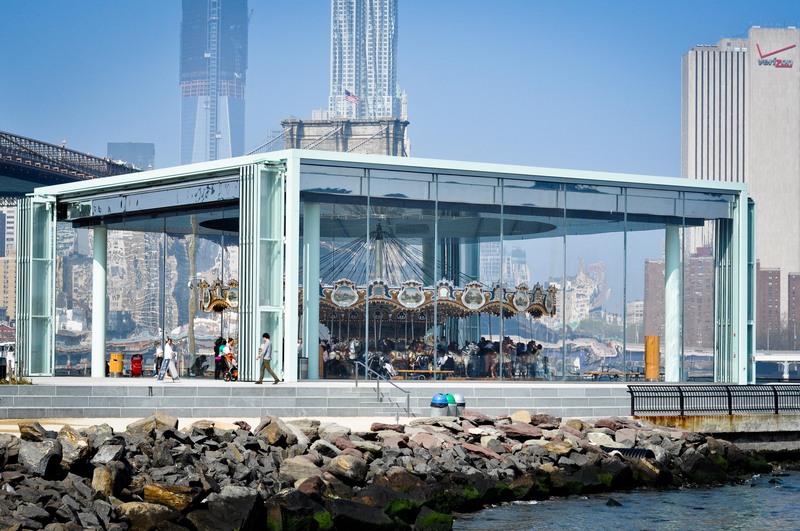 Jane’s Carousel is truly a sight to behold, situated on an outcropping along the Dumbo promenade, against a jaw-dropping cityscape: the Lower Manhattan skyline (including Frank Gehry twisting tower residences and the increasingly majestic One World Trade Center), a full length span of one NY’s most beautiful bridges, the Brooklyn Bridge, and the magnificent Hudson River. As to Novel’s design, one aspect that sets it apart is the acrylic material used to create the walls of the cube. As one looks through it, say towards Manhattan, the seen-through-acrylic imagery of the skyline takes on a surrealistic mosaic look that only accentuates the magical and fantastical elements of the carousel. And apparently during the summer evenings (we saw it during the day in early Spring), they often take it a step further by illuminating the cube from the inside creating a lantern effect, whereby silhouettes of the spinning carousel horses are projected on the walls of the cube. As to the carousel itself, it’s equally fab and lovely looking (though admittedly, we’ve not seen many of them up close but, then again, who has?). 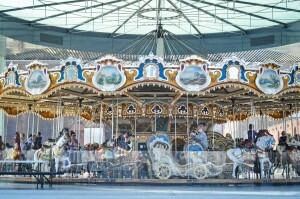 According the its website, it’s a Philadelphia Toboggan Company (PTC) built carousel and one of the few of its kind. 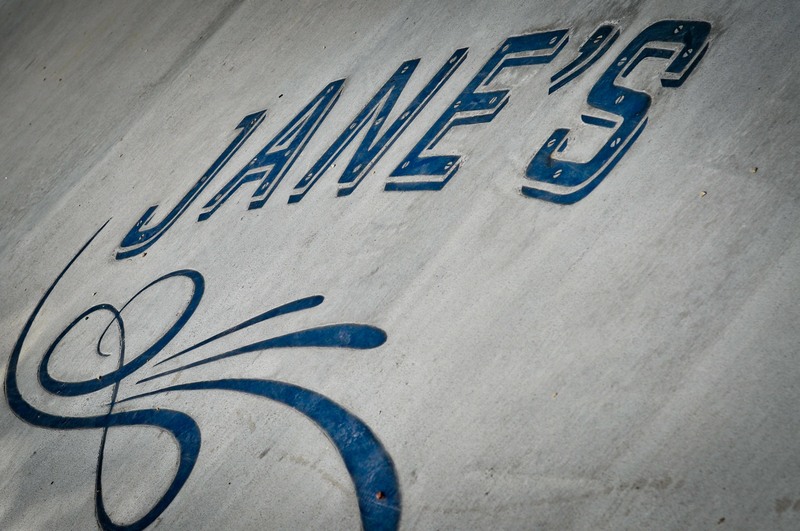 It was purchased and then lovingly restored by local artist Jane Walentas (hence the name), who eventually gifted it to the city of Brooklyn. 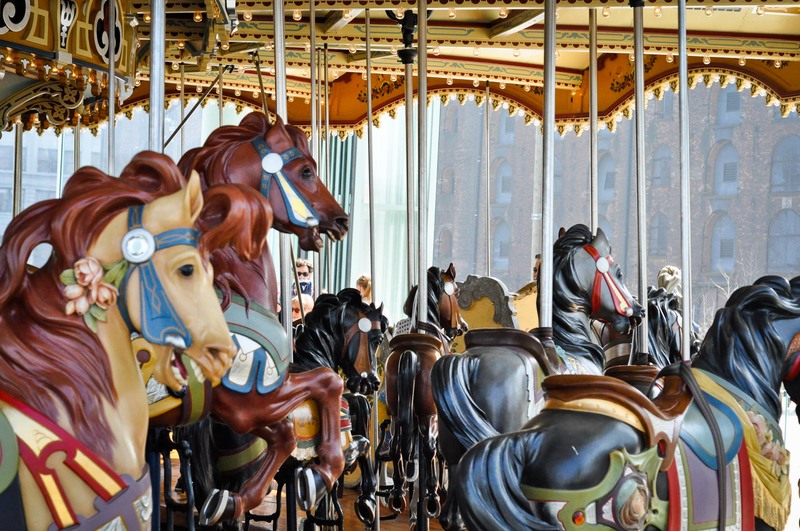 It offers up the usual razzamatazz associated with classic carousels (BTW, is there a difference between a carousel and a merry-go-round? ), from blinking lights and fun music, to the beautifully restored ornately designed horses and chariots. It’s all beautifully done and presented. A real treat for the true kid-at-heart or any architecture fan. Where is it: In Brooklyn along the Dumbo promenade, just below the Brooklyn Bridge. 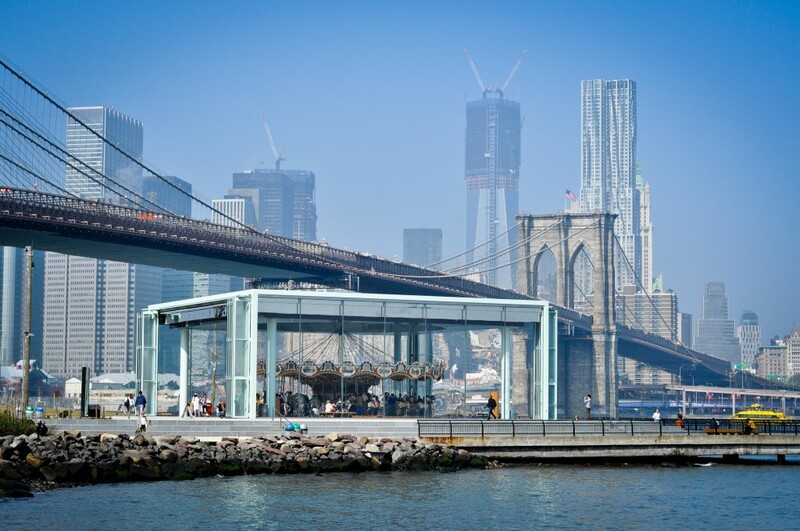 A thirty-minute walk from Manhattan via the Brooklyn Bridge, take the Dumbo/Promenade off ramp path (just before the bridge ends in Brooklyn) and follow the signs to the promenade. Or, take the subway. What’s the little thing that makes its worthwhile? 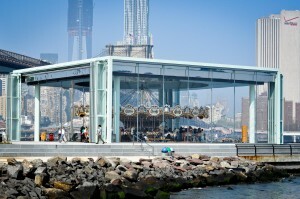 The truly unique sight of an acrylic cube encased carousel set against the majestic skyline of Manhattan. It’s an “only in New York” spectacle.